Weight fluctuation varies from person to person. A quick glance at any weight loss forum will show people fluctuating 2 to 4 lbs. per day all the way up to 10 per day. The bottom line is that your weight will fluctuate, regardless of what you do. Determine how much your own body fluctuates and then avoid contantly weighing yourself. Instead, choose a consistent time to record your weight. Weigh at the same time of day, wearing the same thing, on the same scale. As an experiment, try weighing yourself first thing in the morning when you wake up, in the afternoon after lunch, and right before bed. Do this for a few days to determine your average weight fluctuation. Chances are, you'll weigh your lightest in the morning and your heaviest right before bed. If you average a 5-lbs. weight fluctuation throughout the day, then you know where your weight should generally lie when you weigh yourself. Weight can increase temporarily for numerous reasons. Water, food, beverages, salt, and hormones will all play a factor in the number on the scale. Just as water, food, and any other beverage you consume would change your weight if you held it in your hand on the scale, it will do the same after consumption. It is best not to weigh yourself after eating or drinking. Extra sodium will also cause your body to retain water and weigh more. And most women notice a weight gain just before their menstrual cycle, which may also be related to water retention. Your body may temporarily lose weight due to exercise, lack of glycogen, going to the bathroom, or being sick. Most of these reasons are due to dehydration, such as when you are sick or when you sweat during exercise. A lack of glycogen is basically a lack of carbohydrates, which fuel your body. After not eating or practicing a low-carb diet, your body's lack of carbs will lead to weight loss, but the moment you eat or drink, the scale will go up again. If you are trying to lose weight, weigh yourself daily with the same scale at the same time of day wearing the same thing. Dietician Jennifer Nardone recommends weighing yourself first thing in the morning with no clothing. Knowing that your weight can fluctuate, don't worry if the scale goes up 1 lb. Notice your overall weight trend over weeks and months to determine if you're actually losing weight. Weight loss will also show up in inches. 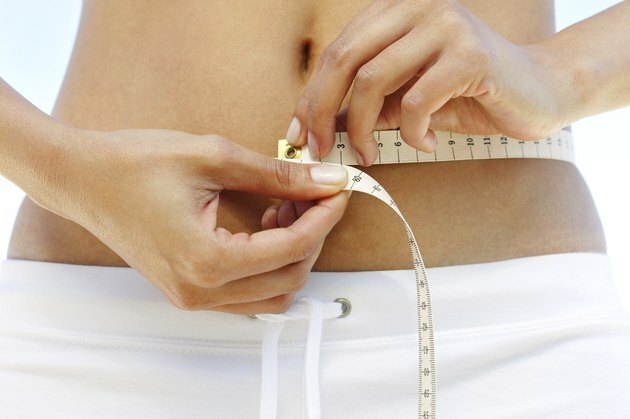 If your goal is to lose weight and inches, measure your body once a month to also track your progress. FitnessforWeightLoss.com: Why Does My Weight Fluctuate? Is It Possible to Gain Weight Within an Hour Without Eating or Drinking? Will I Burn More Calories if I Exercise With a Sweater?